▶ This system includes wood structural panels conforming to the requirements of the U.S. Department of Commerce/National Institute of Standards and Technology documents, PS 1-09 Structural Plywood or PS 2-10 Performance Standard for Wood-Based Structural-Use Panels. ▶ All framing members and blocking are 2-in. nominal or greater except that 3-in. nominal or greater framing is used at adjoining panel edges for closely spaced nails, larger-diameter nails or higher-strength shear walls. ▶ Nails are located at least 3/8 in. from panel edges and fastener spacing at panel edges is not less than 2 in. on center (o.c.). ▶ Foundation anchor bolts have a steel plate washer under each nut not less than 0.229 in. x 3 in. x 3 in. in size except where standard cut washers are explicitly permitted. ▶ Design for shear and overturning provides for properly sized tension and compression chords and shear and overturning anchorage. ▶ Maximum shear wall aspect ratio (e.g., height-to-length ratio) is 3.5:1. ▶ Allowable unit shear strengths range from 200 plf (3/8-in. rated sheathing on one side, 6d common nails and 6 in. o.c. nail spacing at panel edges) to 1,740 plf (19/32-in. rated sheathing on two sides, 10d common nails and 2 in. o.c. nail spacing at panel edges). 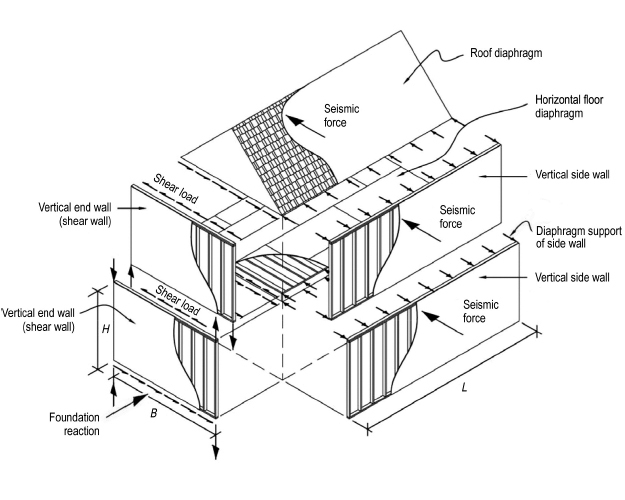 ▶ This system is permitted in seismic design categories A, B, C, D, E and F.
Source: FEMA (2006). Homebuilders’ guide to earthquake-resistant design and construction, FEMA 232, Federal Emergency Management Agency, Washington, D.C. This Figure illustrates the load paths for resistance to seismic forces. When structural panels such as plywood or oriented strand board (OSB) are properly attached to lumber floor, roof and wall framing, they form diaphragms and shear walls that are exceptional at resisting these forces.